1.1 Who is it written for? The aim of this short introduction is to help you use a site that has already been set up so that you feel that you are not just using a mysterious back box. The main focus is on people who do not have much experience of using web sites. Many people start to use a web site that has been set up using Joomla! You are especially likely to do this if you are going to be adding content to an existing site and do not expect to go further with managing the site. You do need to know something about the site and where the Articles are located. This will vary a great deal from site to site, so (obviously!) cannot be covered here in detail. You will need a username with the right permissions for what you are going to do, such as add and edit articles. 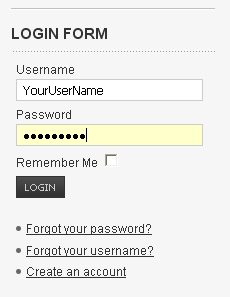 You will be given a username (sometimes called a login) to allow you to alter the content of a site. This shows you how to login once you have a username and password. Find the LOGIN area: this is usually to the left of the page but it can be elsewhere. The screen may look slightly different on different sites, for the name and the position depends on how the site is designed. There are separate boxes for entering your Username and Password. Joomla! allows content to be created and edited by visitors who login with a username with appropriate permissions. The usernames are created, and the permissions defined, by the person who looks after the Web site, usually called the Administrator. There are four levels of permission relevant to adding and editing Articles in a Joomla! Web site. Guests: Some website visitors never login and are just able to read the content. They may also be limited in the pages they can see. Registered users: Others can login but have 'read only' access to the site - in other words they cannot alter anything. You will need to be given a username (with a password) by your Administrator with a level of access that will allow you to edit and create content. Author or Editor: You may be given 'author' or 'editor' permissions, which allows you to edit and add Articles, but does not allow you to 'publish' them. Publishing an article makes it visible to visitors to the web site. Authors can only edit articles that they have created. Publisher: You may have 'publisher' permissions, which allows you to publish articles, as well as adding and editing them. Once you have logged in to the site, there is a hands-on document (part of this series) to introduce you to altering an Article. Hands-on how to begin to edit an Article. This will help you to become familiar with editing in Joomla!